Located in the US near Chicago, Midwest Optical Systems (MidOpt) first began operating in 1988. At that time the assets of another Chicago-based manufacturer of optical lenses, prisms and filters were purchased to form the nucleus of the new company. Continuing with the business model that this purchase afforded, MidOpt started out as a manufacturer and supplier of precision optical components and systems. With the worldwide trend towards more automation in manufacturing, there was also an accompanying demand for significant improvement in product quality, which is where machine vision comes in. MidOpt recognised that perhaps the greatest challenge to the success of any industrial vision system was the control of light in order to maximise image contrast on a consistently repeatable, long-term basis. 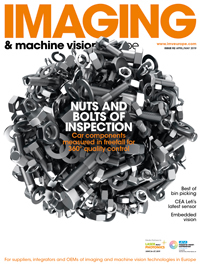 ‘In the early 1990s, most companies involved in industrial imaging and machine vision didn’t feel that filters were particularly useful. This was because those filters that were being adapted were not designed for these new applications. A small and growing demand was noticed for filters designed specifically for industrial inspection,’ Warzak commented. ‘LED lighting was also becoming increasingly popular and it was clear that this would be the new way forward for illumination. MidOpt began to make custom filters that were designed to match the LED wavelength output, as well as the lenses that were commonly used. We could see what the benefits were and why our customer base continued to demand them.’ He added that the main goal of most application of filters was to enhance contrast, which made the Midwest Optical filters easier to sell based on their design, performance and convenience. This rising demand during the 1990s resulted in the majority of MidOpt’s business evolving into the supply and manufacture of components and assemblies for industrial vision applications. This included lenses, lighting, and other optical components, but particularly their optical filters. By the early 2000s, demand for MidOpt machine vision filters grew further by also spreading to European and Asian countries. 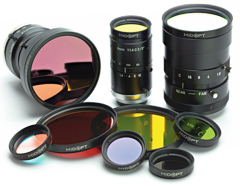 Thus MidOpt has developed a wide selection of precision optical filters designed specifically for machine vision and related applications. Standard MidOpt filters are uniquely designed to be less susceptible to angle of incidence (AOI) issues found with shorter focal length lenses and in wide angle applications (trademarked as StablEdge technology). This technology has always been employed as a design feature across the full MidOpt product range, and is particularly important as the demand for more compact inspection footprints and wider angle lenses continues to grow. The company stocks what it says is the most diverse offering of filter mounts and types for imaging. These filters are compatible with monochromatic to full spectrum cameras, sensors, lighting and lenses from all major industrial imaging suppliers and manufacturers. Its product line offers greater, more repeatable contrast enhancement in a wider variety of lighting conditions, environments, applications and lens focal lengths. While machine vision remains a large market for MidOpt, robotic applications are very much a subset of that, and newer, related markets include drone applications, particularly for agricultural inspection. This application primarily involves single and dual bandpass filters for normalised difference vegetation index (NDVI) aerial drone surveying, often mounted on MidOpt-supplied multi-megapixel S-mount board camera lenses. This combination makes single sensor imaging possible, incorporating the lenses and filters into inexpensive consumer-type cameras. Diffuse reflectance standards for calibrating those cameras while in flight are also now manufactured. Other filters such as linear polarisers, spectrally broad and flat neutral density filters and slip mount adapters are also being offered for aerial imaging. In other newly developing applications, different types and combinations of filters have been identified that are now being used for forensic and paleontological investigations. Dualband filters are also finding use in 3D point cloud imaging applications. It becomes possible to use a single sensor to capture both infrared and RGB information simultaneously in real time. Each pixel has a correct XYZ and RGB value, while usual problems with correcting for overexposure are avoided and RGB colour is returned to an acceptable level. Megapixel imaging at a speed of 60 frames per second over a range of several metres has become possible. MidOpt has identified – and is currently working with – multiple customers that have been introducing innovative new systems catering to the above and other emerging markets. In addition, new manufacturing methods and technologies are being incorporated into production processes in order to control quality and cost. Many are currently not found in use anywhere else in precision optical manufacturing. Over the coming months and years this should allow MidOpt’s product offerings to keep pace with changing demands brought on by technological advancements in other areas and end uses.